Card Text Fight/Reap: Purge a creature from a discard pile. If you do, put a +1 power counter on Eater of the Dead. 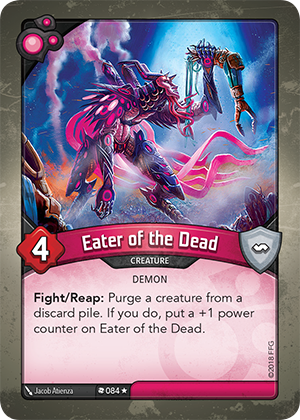 If I fight or reap with Eater of the Dead and there are no creatures in my opponent’s discard pile, do I have to purge a creature from my own discard pile? Yes. It is mandatory to resolve as much of an effect as possible. If you fight or reap and your opponent has no creatures in their discard pile, you must purge a creature from your discard pile (if there is one).